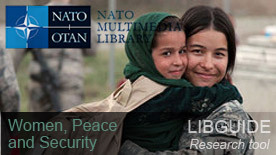 This LibGuide is intended to provide a few starting points to assist you with your research on issues related to women, peace and security, in particular within the NATO context. Improving gender awareness in KFOR. by K. A. Wright. In: International Political Science Review, vol. 37 no. 3 350-361 (June 2016). In the declaration of the Lisbon Summit of November 2010, Heads of State and Government expressed their continued support for the implementation of the NATO/Euro-Atlantic Partnership Council Policy on UNSCR 1325, and related Resolutions, and endorsed a NATO Action Plan for the mainstreaming of UNSCR 1325 in NATO-led operations and missions. ("NATO Action Plan to mainstream UNSCR 1325 into NATO-led Operations and Missions". Ref. PO(2010)0162, 17 November 2010 – not releasable to the public). On 24 October 2014, a new NATO Special Representative for Women, Peace and Security took office, Ambassador Marriët Schuurman. Marriët Schuurman completed her term as NATO’s Special Representative for Women, Peace and Security on 30 March 2017. "Gender Mainstreaming and Integration in the North Atlantic Treaty Organisation" by M. Hurley, published in the eBook "The Palgrave International Handbook of Gender and the Military", pages 403-417 (2017). 85% of NATO members have all positions in their armed forces open to women. 11% of armed forces of NATO countries are made up of women, on average. 6% of military personnel deployed in NATO operations in 2015 were women. 65% of NATO members have support structures in place for single, divorced or widowed parents caring for children. 62% of NATO members have programmes or policies to encourage work-life balance. 52% of NATO members have programmes or measures in place to support parents when both are in the armed forces. And fully 69% of NATO members have a military entity dealing with gender perspectives. 2015 marks the 15th anniversary of UNSCR 1325, adopted on October 31, 2000. The existing National Action Plans for the Implementation of UNSCR 1325 on Women, Peace, and Security (60 countries, as of 2016) by PeaceWomen.org, a project of the Women's International League of Peace and Freedom, United Nations Office.